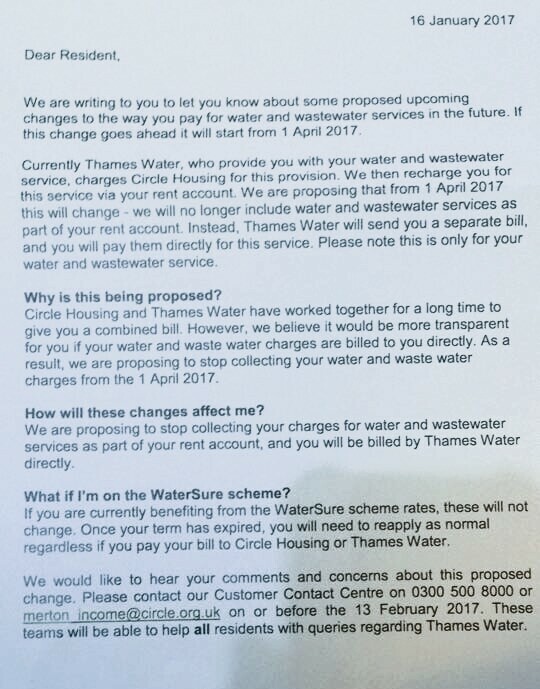 After some residents received a letter informing them of Circle Clarion’s decision to separate the water bill from the rent bill, will all tenants in Merton, and further afield, be receiving notices to pay £300 bills (?) on top of their rent, and will their rent see any reductions beforehand?! It should be noted that leaseholders are probably also subject to these new terms and that residents in flats may find it impossible to get separate metered bills due to flats having multiple water supply pipes to each property. 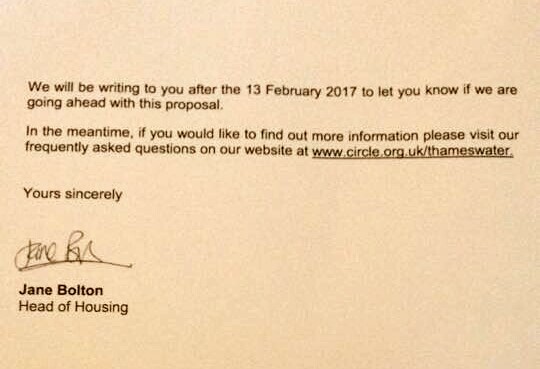 Last year Circle Clarion seem to have instructed Thames Water to install water meters on supplies into each block of flats in anticipation of this new instruction. So this has obviously been waiting in the wings for some time. Many questions need to be answered before this is introduced. Tuesday and Thursday is Circle’s consultation event showing their latest version of the Ravensbury masterplan. It hasn’t looked good at the Highpath & Eastfields meetings with Circle opting for more density ie: floorspace and profit. Circle look like they’ve been given as much support as feasibly possible by Stephen Alambritis (leader of Merton Council & our Ravensbury ward councillor) as well as Merton Council’s Labour Cabinet (plus most all party councillors on the planning committee for that matter). Circle seem very happy to push on rather than off. Merton Council receive some kind of “clawback” funds from this development so it seems to be a win-win for Circle Housing & Merton Council to pally up as closely as possible. The details of this arrangement are hidden in the Stock Transfer Agreement that both of those parties signed up to. This is a commercially sensitive document so we can’t find out what the exact terms are. On Wednesday evening at Merton Council they’ll most likely be voting through the Regen in their full council meeting, so we are hoping to attend that and report back. Our RA meeting will have to be postponed though. Ravensbury Court refurb has been cancelled – Paul Quinn said there was a majority against the plans so he won’t go ahead with it. We don’t know the exact details yet though as they could still decide to do whatever they like as has been the case up until now. The majority was based on 25 homes being surveyed in Ravensbury Court, with 11 against the plans, 9 in favour, 3 neither agree/disagree, 2 don’t know. That’s 25 out of 59 homes, so 42% surveyed. We received a letter stating that the planning officers at Merton Council have recommended that the Ravensbury Garages scheme be granted permission, so on Thursday, 15th September 2016, it will be down to Merton’s councillors to make their decision at the planning committee. We hope that councillors will refuse the current scheme because of the impact it will have on Ravensbury and on the Wandle Valley Conservation Area. Here’s a story on the 24dash housing website about Circle Housing readying themselves for £50m in cuts. Does a £1bn Merton regen project sound more like selling off their stock than anything else with this news?